Yemeni opposition sources say they have agreed to the Gulf Co-operation Council plan under which President Ali Abdullah Saleh would step down after 30 days. The coalition would take part in a national unity government "after receiving clarifications", they added. It had initially rejected the proposal. The GCC plan has yet to be formally accepted by the opposition or Mr Saleh. Earlier, at least two people were killed at separate protests demanding the president resign immediately. One person was shot dead and another 30 were wounded after plainclothes officers opened fire on demonstrators in Ibb, south of the capital Sanaa, witnesses and medical sources said. The second protester was killed in the southern province of al-Baida. 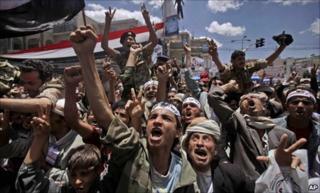 Troops also fired live rounds and tear gas at tens of thousands of protesters in the southern flashpoint city of Taiz. One report said a woman watching the clash from her balcony was shot dead. More than 130 people have been killed by security forces and supporters of Mr Saleh since the anti-government unrest began in January. On Monday evening, a spokesman for the opposition Common Front, Mohammed Qahtan, said it had notified GCC Secretary General Abdul Latif al-Zayani that it was prepared to take part in a unity government. "We have given our final accord to the GCC initiative after having received assurances from our Gulf brothers and American and European friends on our objections to certain clauses in the plan," he told the AFP news agency. On Saturday, the Common Front announced that it accepted the GCC plan with the exception of a clause on the formation of the new government. The GCC proposes that President Saleh will submit his resignation to parliament, and hand over power to his vice-president, 30 days after asking the opposition to appoint a prime minister to form an administration including ministers from his ruling General People's Congress party. The opposition had said Mr Saleh would have to step down before a new government was formed. Mr Saleh's resignation would also be dependent on parliament passing a law providing immunity from prosecution for the president "and those who worked with him during his rule", the GCC initiative says. The Common Front's change of heart comes after the US ambassador to Yemen reportedly pushed the coalition to accept the GCC deal. The General People's Congress agreed on Saturday to participate. Analysts say that allowing the president to stay on for another month could exacerbate the crisis in the poorest Arab state. Many protesters, unconvinced by the GCC plan and distrustful of Mr Saleh's promise to go after 32 years in power, have called for more rallies. Thousands remain at a permanent protest camp in Sanaa.